Kalimudah and Kalikecil are the perfect combo for those who want to play a bit longer in the canyons! 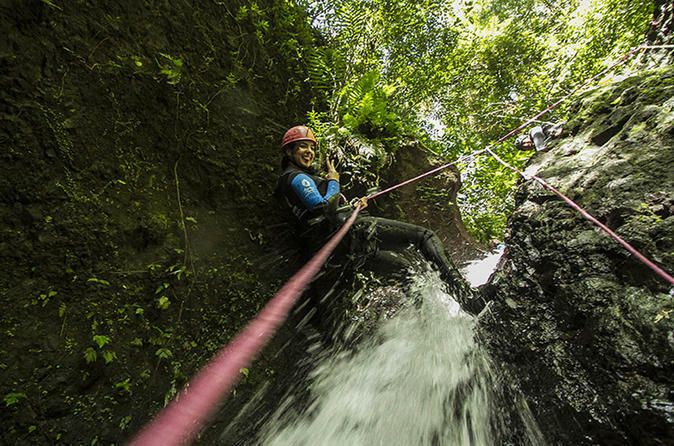 An experience loaded with jumps, slides, and fun rappelling suitable for everyone. You will be picked up from your Bali hotel to begin this day full of excitement . After about a 1.5 hour drive from your hotel to our base camp, you will get a light breakfast and an introduction to the ICOpro Canyoneer Initiation course to allow you to be independent during the trip. After a ten minute drive in a pickup, and ten minute walk down in the Bali jungle, you'll reach the start point of Kalimudah Canyon. Here, you'll spend approximately 3.5 hours with 10 rappels up to 15m, 6 jumps (Optional) up to 8m, 4 slides (optional) up to 6m, or swim up to 20m. You'll enjoy another ten minute hike to reach the pickup and back to the base camp. Afterward, you'll shower, have lunch, and receive your "International Canyoning Organization for Professionals" Canyoneer initiation certificate, or "ICOpro card", with the photo you provided**. Sit back and relax in our air-con transfer back to your hotel. **Bring a USB flash disk or external hard drive with the photo you wish to be used for your ICOpro card.